Piano I and II, octave unison vocal chorus. Flowing ballad with piano as the focus. Simple ooh and ah vocals are added for color on a countermelody in this reflective arrangment. 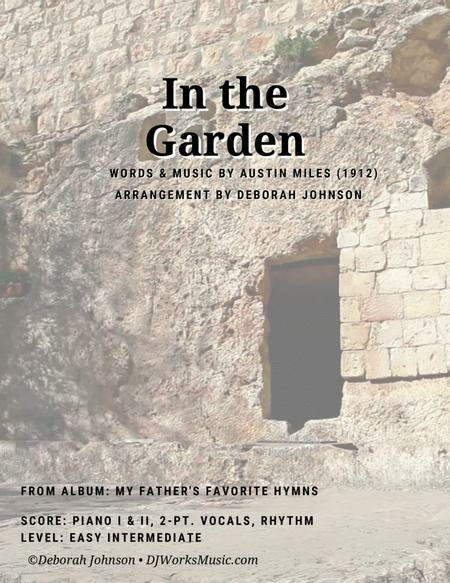 Piano two adds octave melody in a higher register to add more color and can be played by even a beginner pianist.From My Fathers Favorite Hymns, up for a 2012 GRAMMY Award, available on Amazon (http://amzn.to/1fSaWVe) or CD Baby (http://www.cdbaby.com/cd/deborahjohnson) by Deborah Johnson. There is also a beautiful spiral-bound devotional guide available with the amazing stories and life principles gained from these timeless classics, as well as all the music arrangements in one spiral-bound volume. Both are available on Amazon. 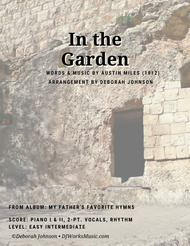 Written by Austin Miles (1912), a pharmacist who became an editor of hymnals and songbooks as well as a popular music director. His hobby was photography and the beginning of this song was composed waiting for some film to develop. For more information about Deborah, her albums, books and products, visit www.DJWorksMusic.com .